Running has been intensely growing in popularity over the last several decades. Over 16 million Americans run over 100 days a year. Even a recession can’t stop the world from running. In fact, there has been an increase in running shoe sales! Marathon races have had a 10 percent increase between 2008 and 2009 and half marathons have risen over 20 percent. With the incredible increase in running, we have also seen an increase in running injuries. Navicular stress fractures have been considered a relative rare injury to the foot, but are now being seen more commonly among runners. In 1980, navicular fractures were reported to have an incidence of 0.7 to 2.4 percent of all stress fractures. In more recent studies, the incidence has increased to 14 to 35 percent. 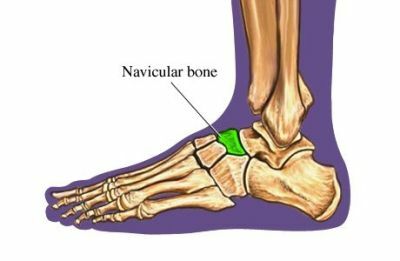 The navicular bone is located on the inside, middle portion of the foot. It is considered the keystone of the arch. It articulates with five other bones and has an intense network of surrounding ligaments. The posterior tibial tendon, a major tendon in foot function, attaches to the navicular. During foot strike, the bone is compressed between the surrounding bones. Repetitive, forceful impingement of the bone can lead to uncompromising stress that causes a fracture. Navicular stress fractures present as vague, achy pain in the midfoot that can radiate through the arch. It is often mistaken as a posterior tibial tendonitis due to very similar presentations. Pain is worse with activity and continues to increase if untreated. Often, the pain will subside with rest but pain free intervals will become shorter. Studies looking at elite athletes showed that track and field runners accounted for 59% of all stress fractures. The the most famous athletes to suffer from navicular fractures are Michael Jordan and Yao Ming, basketball superstars. It is still debated the exact risk factor for such fractures outside of increased activity. Metatarsal stress fractures are common in persons with a high arch much such a correlation with navicular fractures has not yet been made. The increase use of minimalist running shoes may also increase the risk of stress fractures due to loss of shock absorption provided by traditional running shoes. Treatment of navicular fractures leaves runners off their feet for up to six weeks. No runner or any athlete wants to have a limiting injury but a navicular fracture is just that. Michael Jordan treated his navicular fracture with a non-weight bearing in a cast for 4-6 weeks. Yao Ming treated his fracture with surgery and a screw. There was some speculation in the medical field that surgery could lead to a faster recovery and return to full activity. Studies now show that Non-weightbearing for 4-6 weeks has an average return to full activity in about 5 months and has the highest success rate when compared to other treatments. Surgery does not seem to improve outcomes or time to return to full activity. Running is an incredible sport that has many benefits. It has great cardiovascular and weightless effects. It can, at the same time, put increased stress on your feet and other joints. Running through pain should never be recommended and every runner should be careful to protect their feet and respond to pain to prevent serious injuries.